On Sale for only $219! THIS IS THE BEST METER YOU CAN BUY! The Only Meter with a 5-Year Warranty! Here's what you need to look for in a Tint Meter. Only found with the Advanced Light Transmitance Meter(ALTM). Warranty - Only meter with 5 year Warranty. Ease of Use - Simple and Fast. Only 3 seconds to measure a window. Accuracy - Only Meter Tested and Proven Accurate and Repeatable by an Independent Testing Lab in New York. Reliability - This meter is used in all 50 states and several countries. Customer Service - We value your business. The meter is used in all 50 states and several countries. The Advanced Light Transmittance Meter(ALTM) is superior in each of these areas. Don't waste money buying a cheap product when you can get the best at an excellent price with a 5 year warranty. In more than 20 years, we have NEVER charged to repair a meter. Think about that! We greatly value our customers. Cheaper products are assembled in China and don't compare with the ALTM. Other meters only offer a one year warranty and most haven't even been on the market for five years. For a limited time you pay only $219. ORDER TODAY! Order on line using Mastercard, Visa or American Express or call 1-800-865-1820. 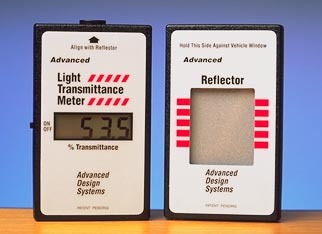 The Advanced Light Transmittance Meter is a precision optical instrument that is used to measure light transmittance through tinted automotive windows and for the enforcement of window tinting laws. It is very easy to operate and only takes 3 seconds to measure the light transmittance through a window. Thousands in use by Safety Inspection Stations and Law Enforcement Agencies in the U.S. and several other countries. For quantity pricing call us at 1-800-865-1820. Call 1-800-865-1820 to order by phone.